The 327-foot-tall Ares I-X rocket sits perched atop Launch Pad 39B at NASA's Kennedy Space Center in Florida for an Oct. 27, 2009 test flight, but it's not the tallest structure there. On either side of the pad are 100-foot fiberglass lightning masts mounted atop 500-foot towers. The rotating service structure, or RSS, was retracted from the rocket at midday on Oct. 22. NASA?s testlaunch of a brand new rocket this week will last only minutes, but the spaceagency is expecting thousands of spectators to flock to its Florida launchingsite to watch the historic show. The AresI-X rocket, a suborbitalprototype for a new booster designed to launch NASA?s planned shuttlereplacement craft Orion, is slated to blast off Tuesday morning, weatherpermitting. But what exactly will the throngs of onlookers see at liftoff? ?It?s goingto look pretty spectacular,? said Bob Ess, NASA?s Ares I-X project manager. Standing at327 feet (100 meters), Ares I-X is a towering rocket ? and currently the world?stallest booster in service. 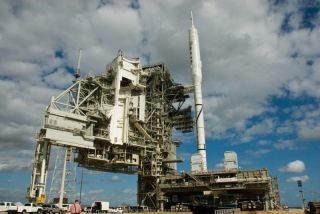 Its $445 million test flight, which should lastabout two minutes, is poised to launch Tuesday at 8 a.m. EDT (1200 GMT) fromLaunch Pad 39B at NASA?s Kennedy Space Center in Florida. It has beenmore than 30 years since NASA launched something other than a space shuttle to testa manned spaceflight system. NASA will broadcast the launch live on NASA TV,which will be webcast simultaneously. For thosespectators in the area of the Kennedy Space Center on central Florida?s easterncoast, the test launch should be viewable for miles around. The Kennedy SpaceCenter Visitor?s Complex is selling tickets but other venues are available,much like during shuttle launches. Just don?texpect Ares I-X to blast off like a shuttle. For one thing, it will roar offthe pad a bit faster than a space shuttle, Ess said. When NASAshuttles liftoff, they actually ignite their three main engines six secondsearly to begin building up thrust before the countdown clock hits zero. Afterthose six seconds, a shuttle?s twin solid rocket boosters ignite, explosivebolts holding the spacecraft down are severed and the entire stack soarsspaceward. The gleamingwhite Ares I-X, at its core, is a giant solid rocket booster. As aprototype for the two-stage Ares I rocket, its first stage is a four-segment solidrocket motor capped with a dummy fifth segment. The second stage, Orion capsuleand launch abort tower atop Ares I-X are all dummy segments, too. There is a1-in-10,000 chance of a disastrous failure during the test, but NASA isconfident it will go as planned. So when theclock hits zero, there will be no six-second build up or giant plumes of steamfrom the water sound suppression system like those seen during shuttlelaunches. The explosive hold-down bolts will fire and the rocket should simplyzoom off the pad, mission managers said. ?It?ll getup and go a bit faster than the shuttle does,? said Ares I-X launch director EdMango. Unlikerecent shuttle launches to the International Space Station, which headnortheast after liftoff, Ares I-X will head due east out over the AtlanticOcean. The rocket is long and slender, and fatter on top because its secondstage is thicker than its solid rocket motor-powered first stage. That meansit will look weird, Ess said. ?I think,being long and thin and slender, optically it will look very strange comingacross,? Ess said, adding that the first visible thing should be the standardroll program to orient the rocket. ?You?ll see the whole vehicle turn around byitself and then just kind of head due east ? I think it will move prettyquickly.? There are700 sensors on the Ares I-X rocket to measure things like vibration, speed,performance and other data. Mission designers have added little tweaks to theflight profile to move the rocket?s motor nozzle slightly in order to measureits effect on the booster. ?Itprobably won?t be visible to you,? Ess told reporters. NASA needsgood weather to launch Ares I-X because engineers need to see the rocket flightall the way through first stage separation, which will mark the end of thetest. Thatstaging point is expected to come at about the 124-second mark, when thesupersonic Ares I-X rocket is traveling Mach 4.7 ? more than four times thespeed of sound, its max speed for the flight. The rocket stages should separateat an altitude of about 130,000 feet (24.6 miles or 39 km) and continue upwardsuntil they hit a maximum altitude of 150,000 feet (28 miles or 45 km). ?Onceseparation occurs, that?s really the end of the launch trajectory,? said DougCooke, associate administrator of NASA?s exploration program. Observers atNASA?s Kennedy Space Center and nearby viewing areas around the region, likethe banks of the Banana River, may get a glimpse of stage separation. But onlyif the weather is clear. Ares I-X will be a bit farther away than a launchingshuttle, Ess said. ?I thinkyou may be able to see something happen in the sky, two white dots instead ofone white dot. But I don?t think it?s going to be very clear,? Ess said, addingthat television camera views should be better. ?If we have any cloud cover,it?s going to be difficult.? The AresI-X dummy second stage is expected to crash into the ocean about 147 miles (236km) east of the launch pad. The first stage, however, is equipped withparachutes and designed to splash down in the ocean ? much like shuttle rocket boosters? to be retrieved by a recovery ship. A reportreleased last week by an independent panel appointed by the White House toreview NASA?s humanspaceflight plans suggested that President Barack Obama and the spaceagency consider scrubbing the Ares I and pursue commercial rocket boostersinstead. But Mango said the data gleaned from the test flight and itspreparation will be vital, even though the Ares I rocket?s ultimate fate isuncertain. ?Evengetting to this point, the team has learned about getting a vehicle designedand ready to be launched,? Mango said. ?It?s really an inspiring point to beat.? SPACE.comwill provide full coverage of NASA's Ares I-X test flight with Staff WriterClara Moskowitz in Cape Canaveral, Fla., and Managing Editor Tariq Malik in NewYork. Click here for full missioncoverage.